A turnout. We'll need 1 digital output to drive that. A route indication signal on each leg of the turnout. We'll need an LED for red, and one for green (technically it'd be blue here in NZ). That's 3 pairs of outputs = 6 more. A push button to control the turnout. That's 1 digital input. That's 8 pins right there, doubled for the other end of the loop, makes 16 pins. That's nearly an entire Arduino dedicated to just one piece of track! Naturally we'll be having more than just a single crossing loop on our railway, yet we have no more Arduino pins left. What are we to do? The answer comes in the form of a 74 series logic chip, the 74HC595. This is a serial-in, parallel-out device. We send it the state of each pin using 3 data pins, and it updates each of its 8 pins. So already using 3 pins we're able to drive 8 output pins. But the best part? They can be daisy chained. That means with 3 data pins, we can control an unlimited number of 74HC595 devices! Suddenly our job just got a whole lot easier. Notice how the Q7' pin is daisy-chained to the next device, while the ST_CP and SH_CP pins are shared. Now using 3 data pins we're addressing 16 outputs. Fantastic. What does the code to deal with this look like? You can see we're using a new method here, cmri.get_byte(n). Rather than inspecting a single bit, this returns an entire byte, which we then shift out to the 74HC595 using the shiftOut method. Toggling the LATCH pin is how we tell the 74HC595 that we're busy sending it data; it only updates the output pins once we take the LATCH pin high. That was pretty easy, but what if we have a massive CTC panel and want dozens and dozens of inputs? Or we have gone a little crazy with occupancy detectors? Can we do something similar? Luckily we can, using the CD4021 "8-Stage Static Shift Register". It's just the opposite of what we've seen above. 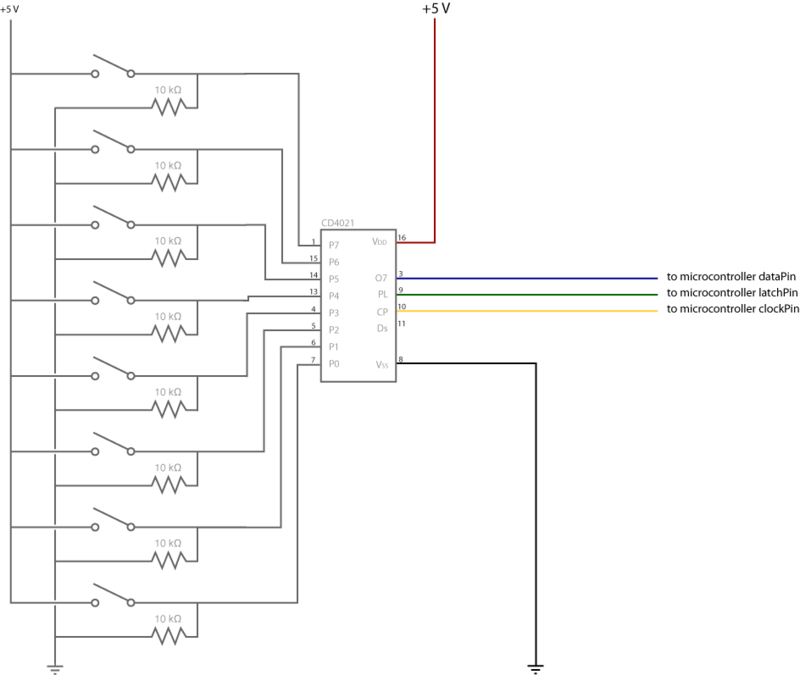 The schematic is a little messier because of all the pulldown resistors, but you get the idea: 3 data lines to the Arduino. We're using a new method again here, the cmri.set_byte(n, b) which sets the given byte to the value read in from the CD4021. Using a combination of the 74HC595 and CD4021, you should be able to easily address dozens of inputs and outputs from a single Arduino, while using only half a dozen pins. This leaves other pins free for more interesting tasks. Suddenly wiring up your entire goods yard is not only possible, but quite easy. Just found your C/MRI Arduino library on GitHub and I love it! I have been using JMRI on my garden railway for some years and I have been looking for some way to drive relays. As I have several Arduinos, your library is a perfect solution. Just tried it and it works a treat.<br /> <br /> Thanks. cannot see how old pin output settings are retained when sending a new bit, i.e. do we need to use 'OR' bit mask?